Ever since I met Goldie, my ’69 MGB sports car, a few weeks ago, she has given me only immense pleasure. The rhapsody of her glorious exhaust note, phenomenal handling, graceful lines, perfecto British driving position… heck, even all her electrics work and she doesn’t leak (too much) oil! Almost as amazingly, I had driven her more miles in 3 weeks than I drove my former B in 3 years, without having to make a single adjustment. Was my B even British or what? The scenario: driving down highway 85 at midnight, around Saratoga, CA. The plan: to burn a little fuel in the Santa Cruz mountains after a long day, in which I studied/worked from 6am-10 p.m. straight. Had her hood up for the first time since we met (never new how nice and cozy a “hooded” B could be as my ’74 had no top whatsoever), and KFRC was only playing the Beetles that night. Cool. The sound: vrrroooommmvroooooommmvroooooommm cough vrooom vroom cough hush-a-bye baby silence. Good night. Sounded like she was out of gas. Funny, I had just put in 6 gals (gallons that is) a few days ago and her fuel guage read one-third full. “Well these Brit guages probably were never too accurate,” I surmised. Put her in neutral and we rolled down the shoulder of the highway with her blinkers on. She finally came to a stop, 200 ft in front of one of those highway call phones. Cool. The tow truck arrives and the driver would stand there for a minute or so and just admire the car. “I always wanted one of these, and yours is in such great condition!” he exclaims. Nice guy. We talk about Brit cars all the way to the nearest Shell station, and I expressed my suspicion that I had just ran out of gas. I fill ‘er up. To my dismay, she only takes 7 gals before the gas nozzle clicks off. “Oh, but look, the car is jacked up and is about 30 degrees from vertical due to the tow truck,” the driver says. He had a point, and the B started right up, seemingly confirming my suspicion that I had just ran out of gas. We’re ready to roll. “How much do I owe ya,” I ask the guy. “Nothing, man, your Triple A card will take care of everything.” Cool. So off we go, back to home in Palo Alto. I was about a mile away from the Page Mill exit when I started to estimate her gas mileage. “Let’s see, I went 90 miles since I last filled her up, and she had at least 6 gallons in her, so she could only be getting at most 15 mpg?” Funny, at about that time her engine cut off again and she decided to take a snooze. Apparently the problem wasn’t due to the lack of gas. We come to a stop on the shoulder again. No call phone nearby this time, oh oh. Refusing to panic, I instantly realize that all we had to do was go about 200 feet until highway 280 would just go downhill into Palo Alto to the Page Mill exit. I switch on the ignition, and the fuel pump, now clicking violently and rapidly, builds up enough pressure to start the car and even allow her to go that 200 feet before the engine clicks off. Yes! We roll down the highway, and make it to the exit. Page Mill Road has a couple of rollers too, but again, the same technique works each time. Just 3 miles from home. We’re going to make it, we’re going to make it! By that time her fuel pump is dead, kaput. We roll into the parking lot of an Italian restaurant. It’s 2 am, and I reluctantly resolve that I have to abandon her. We say our goodbyes and I walk the 2 miles home. Thoughts go through my mind: what will I do? Are there even any auto stores or service stations open on Thanksgiving? Will I be able to make the trip to Stockton? 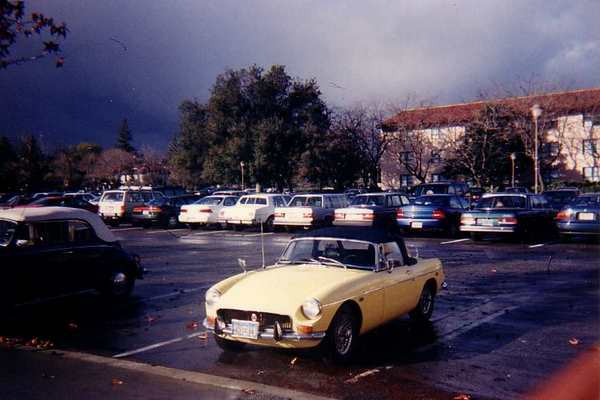 What will I tell my friends and family, and my folks especially, who never really liked the fact that I had bought “yet another unreliable, unsafe British sports car”? I managed to get a few hours of sleep before my alarm clock went off at 8:00. I open up the yellow pages and call a dozen or so auto stores. None open now, maybe one will open at nine? I wait an hour before making the second round of phone calls, but still no auto store opens up. So scrap plan A (the one where I would fetch a new fuel pump for the MG). On to plan B: I would ride over to the Italian restaurant where my car was (unhappily I’m sure) awaiting, and fix the fuel pump. But now time for the big decision: would I dare attempt the 90-mile trip to Stockton with a temperamental fuel pump that had already left me stranded once? I consult with a friend and he asks me what are the chances of the car not breaking down again. “I’d say 60/40 that she would break down at least once,” I respond. “Cool,” says my friend, obviously the type great at giving advice! I ponder a little more. I eventually recall the words Moss Chairman Howard Goldman wrote back in ’92 regarding his decision to drive his untested newly supercharged Sprite across country, for 3000 miles. “It”s an English car after all, we must have faith, so let’s go for it.” Suddenly the decision was not very difficult after all. After another hour comes the big moment. Has 2 hours of lying on the highway been in vain? I switch on the key…the fuel pump builds up pressure. Sounds a lot better… not clickin’ like crazy any more. Yes, she starts up. Yes, we’re on the road again! Yes, I had actually diagnosed the problem correctly and fixed it, something that didn’t happen often at all during my teenage years with my ’74 Migbee. What a glorious feeling! The drive was uneventful ever since, just beautiful weather and a great drive. I arrive in Stockton hours later than I had planned, no big deal. So this is what it’s like owning a British car, eh? I’m hooked….